When you first build a fireplace, you may be surprised to learn that there are endless options for design and materials for the mantel. Many home or business owners quickly become overwhelmed by the sheer number of options available to them. These choices can be made more manageable if you know the major things to look for when choosing your fireplace mantel. The design experts at SoCal Fireplace Mantels can help. The first consideration is the design. 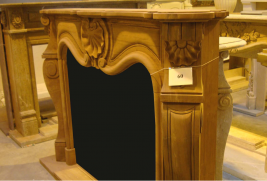 There are a number of designs for mantel available, from British Colonial mantels to modern mantels, Art Deco mantels, ornate fireplace mantels, and everything in between. SoCal Fireplace Mantels offers dozens of design options, and you are likely to find several that you are drawn to. To make your decision, consider the furnishings in your home. Your mantel should blend in seamlessly with your décor. Another important decision is the materials for your mantel. SoCal Fireplace Mantels offers a wide variety of natural stone options, from classic white and yellow marble to maroon marble, travertine, sandstone, and much more. We also offer a number of cast stone options for those who prefer a more even, uniform look for the stone. If you are still having trouble deciding, our skilled design experts can help. Come to our showroom in Van Nuys to look at our extensive array of design and stone options and discuss the selections, or schedule an appointment for one of our experts to come to your home and view your décor in person.